Quakerism has its roots in Christianity. George Fox was a Christian. Many Quaker ideas, terms, and values come from Christianity. Worldwide, the majority of Quakers today have no doubt that they are Christian. I don’t think anyone is arguing about the foregoing. The problem comes in when we look at British Quakers today, many of whom have troubled relationships with Christianity. (This is a casual blog post and contains no statistics or footnotes. People have done surveys, though, and they usually publish them in the journal, Quaker Studies.) People, quite reasonably, start to ask questions like: Are Quakers Christian? For example, if you’re a university chaplain and you want to know whether to file the Quaker leaflets in the Christian box or the Other box, you might ask that question. In that case, I think we got a compromise and half the leaflets went in each box, but not all such questions are so easily settled. I don’t generally call myself a Christian, but sometimes I use the ambiguity of Quakerism to claim Christian privilege – I say, “I’m a Quaker”, and let people make their own assumptions, in situations where the easy assumption is that I am therefore a Christian (a bit low church, left of the Methodists but still on the chart). Actually, sometimes people tell me that I am a Christian. “I thought you were the most Christian Guider here, because you do all the prayers and things,” a very confused Brownie said to me once. “You’re as Christian as I am, and I’m a Christian,” a rather more theologically sophisticated f/Friend told me another time. I think I’m not a Christian because I take it to be the case that to use the term ‘Christian’ you have to think that Christ is important, probably the most important thing, in your religious life. I’d expect maybe some beliefs about Christ being manifest in a bloke called Jesus, that sort of stuff, but I can be flexible there; but Christians have Christ. Christ is basically meaningless to me. I can relate to some of the things that Jesus is reported to have said, though I’m a little wary that accepting him as the highest teacher boils down to having a man tell me what to do, and I’m not keen on that. I don’t know – spiritually, I’ve read theology about this but it doesn’t make any sense – I don’t feel how one can tell the difference between the Christ, eternal and sometimes incarnated, and the Spirit, moving through and working in the world. I’m fine with Spirit language (though you’ll notice that in casual uses I tend to drop the ‘Holy’ – not because it isn’t, just because I don’t want to sound churchy when I ramble on about mad religious stuff). I don’t sense Christ in the world, and if I feel the Presence in the Midst I call it the Spirit covering us. I guess the real issue here is about boundaries – where is the edge of the Christian community, and am I still inside it? I read a blog post recently about boundary dwellers along the US/Mexico border. I think there’s a metaphor in that – I have a passport which I can use to enter some Christian spaces (theology conferences, church services, cathedrals), but I also live much of my life in nearby countries, where a lot of the culture is similar but the laws are different. In this metaphor, I think Quakerism is an organisation with offices in a lot of different cities, so I can pop in and out wherever I am. Quakers have a peculiar use of the word ‘concern’. It can be used in its ordinary sense, as a near-synonym for ‘worry’, but also in a technical sense: a concern is a worry that is taken up by a Meeting, perhaps passed up through a series of Meetings, to become a Concern. Some examples of these meanings in use: I’m concerned that we won’t have any vegan cake at shared lunch today, I have a Concern about asylum seekers going hungry, members at Area Meeting are concerned that we won’t get to tea on time, Area Meeting is Concerned that animal charities in our region need more support, our Friend is much concerned with other people’s business, Meeting for Worship for Business has carried forward our Concern about deforestation in the Amazon by asking our Clerks to write a letter to amazon.com. Ideally, as the Quaker Jargon Buster explains, a Concern is a leading from the Spirit which is tested by a business meeting before being accepted; you can see in my examples that once this has happened, we sometimes speak of the Concern as belonging to the whole Meeting. If a Concern goes through a process of being passed up to a wider Meeting, it can be adopted on behalf of Friends across a whole area. This process of testing is one of the ways in which we seek to protect against unhelpful and non-Spirit-filled ideas, and these acts of group ownership lend a huge amount of support to those leadings which are taken up. Arguably, a Testimony is a Concern that grew up. A true Concern is a powerful thing. Have you ever had a Concern? Have you seen one in action? I may not be all that artistic, but I like to do craft work and it often comes out pagan-themed. 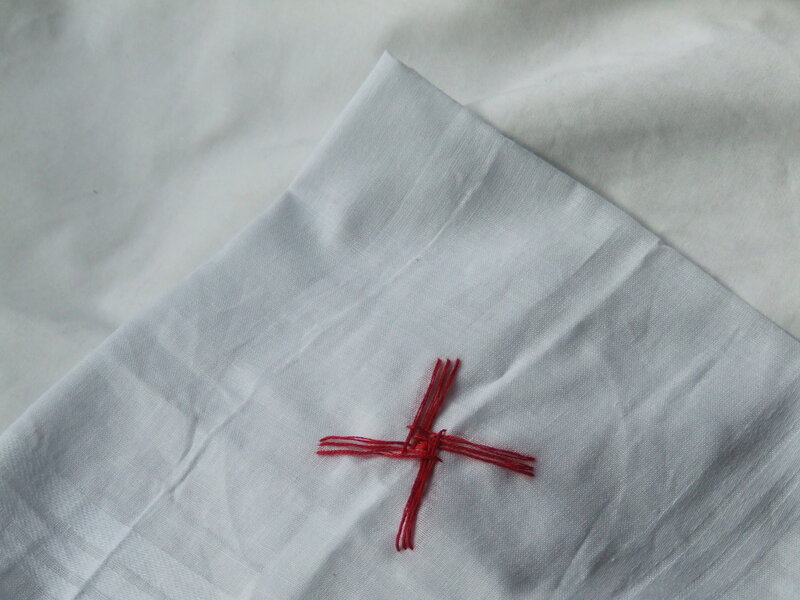 Above is a handkerchief I embroidered – adding a simple Brigid’s Cross made it into a small but useful altar cloth. I carry it in my ‘traveling altar’, a bag of useful pagan bits I can use for rituals when I’m away from home. 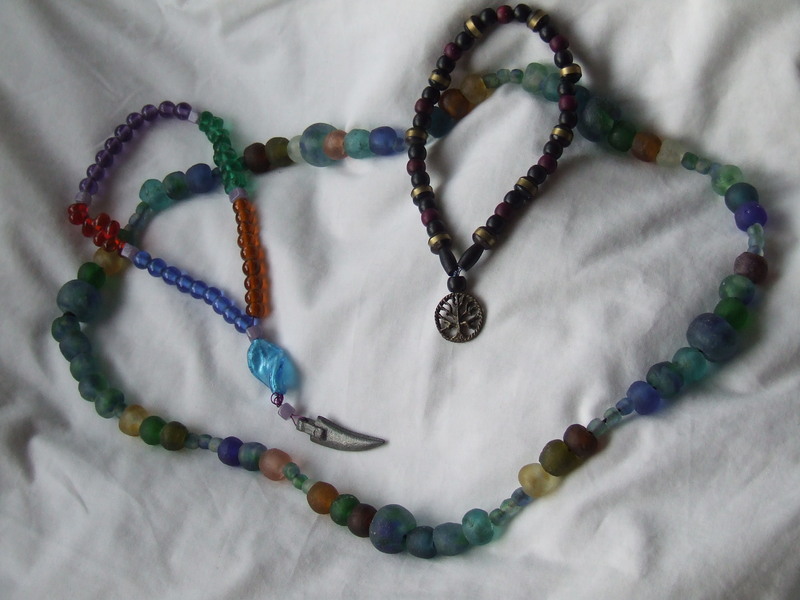 I enjoy making prayer beads – sometimes I think I get more out of making them than from using them! Here are three of my favourite strands. Around the outside is a string for Merlin and Nimue, made from recycled bottle glass beads. I love the mixture of earthy and watery tones. On the left is a string for Brigid – the knife blade represents Her three aspects of smith-craft, surgery (an aspect of healing), and cutting, incisive or satirical poetry. Finally, on the right is a string for Bile, a Celtic Tree God important in some understandings of Druidry. Painting a candle holder with glass paint pens is a quick and easy way to dedicate a candle to a particular cause. 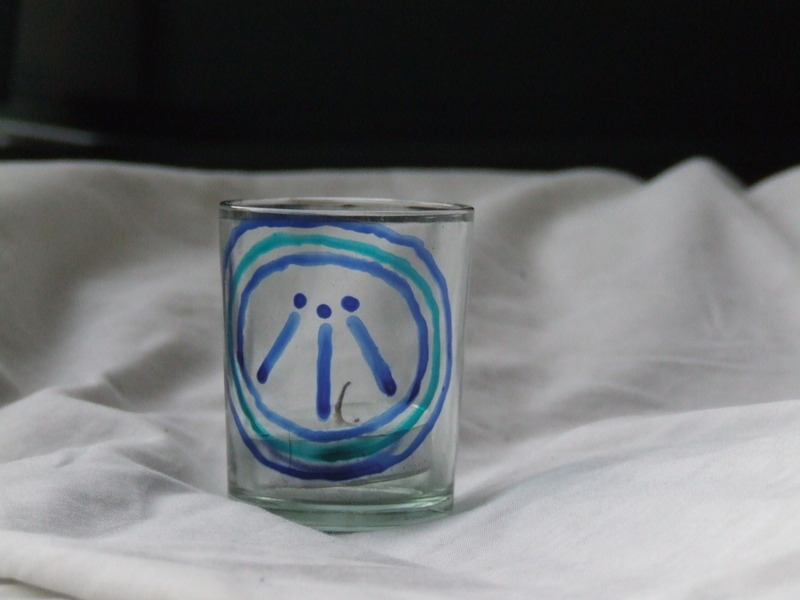 Here’s one where I drew the Awen symbol, in the blue of the Bardic grade, to use in my Bardic Grove rituals. What crafts do you make for the Craft? In both Paganism and Buddhism, one of my favourite things to do is to chant. I enjoy singing, but am not good enough to get my head around anything very complex; the simplicity and repetition of a chant is just at my level. Here are a few of the ones I like best. She Changes Everything She Touches – a classic by Starhawk. I first heard this when I was with a group of Quakers and we bumped into a group of American Wiccan woman in West Kennet Long Barrow. It’s an amazing place to sing, spiritually as well as acoustically. Om Tare Tuttare Ture Soha – Tibetan Buddhist mantra for the Bodhisattva Tara. This is one of many versions on YouTube, but the one I actually listen to at home is Steven Halpern’s version. We Are The Old People – simple lyrics by Morning Feather and Will Shepardson make a strong chant. Ubi Caritas – a Christian chant, from the Taize community, with simple lyrics. May The Circle Be Open But Unbroken – a very well known and widely used chant. My favourite recording is on the Findhorn Foundation’s CD, Garden of the Goddess.